The Life of Mo: We're tidying up! At the end of December, I read The Life Changing Magic of Tidying Up by Marie Kondo and got very excited. There are some crazy parts of this book, for sure, but I loved Kondo's thorough methods for going through your stuff and paring down to what sparks joy. 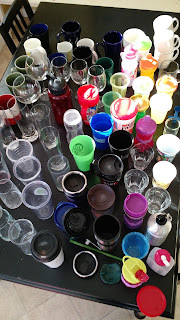 The amount of stuff in our house had really started to bother me - it was hard to clean and hard to put things away. We have only sporadically decluttered after moving here, and we still had stuff like we lived in a much bigger house. She recommends going through each category of item in your home and looking at them all together and touching each one. So, that's all my shoes. 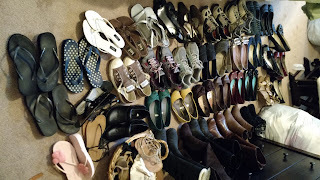 (Clearly, I owned two many pairs of shoes.) 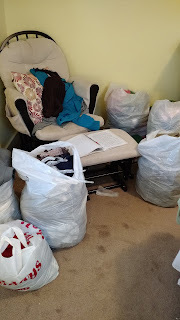 It seems like a simple thing, but gathering all the things makes it much easier to see what sparks joy and what's just a duplicate and what I actually forgot I had in my closet. This is all our cups on the kitchen table. There are 4 people in this house. I don't believe we've ever had more than 8 people eat a meal here. I had no idea we had so many until I pulled them out of the cabinets. 13 bags/boxes have left our house so far. Matt and I have done clothes, books, and papers, and started slowly on the miscellaneous stuff, like DVDs and cups. We haven't even started on the rest of the kitchen cabinets or the girls' massive wardrobes and toy collections!